Citation: D. Kanimozhi, S. Divya Mary, S.J. Gayathri Pillai,B. Devendar Rao, M.L. 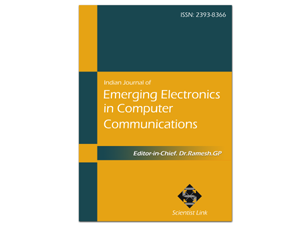 Alphin Ezhil Manuel (2014).Secure Authentication of Multicast protocol for Ad-Hoc Networks .Indian Journal of Emerging Electronics in Computer Communications,Vol.1,Issue.1,pp.128-133. multicast stream authentication and signing is an important and challenging problem.applications such astroop coordination in a combat field, situational awareness, etc.the main challenges are fourfold.first,authenticity must be guaranteed even when only the sender of the data is trusted. Second, unguaranteed connectivity to trusted authorities make known solutions for wired and single hop wireless network inappropriate.we propose an efficient Scheme, Tiered Authentication scheme for Multicast traffic (TAM) for large scale dense ad-hoc networks. TAM combines the advantages of the time asymmetry and the secret information asymmetry paradigms and exploits network clustering to reduce overhead and ensure scalability. Multicast traffic within a cluster employs a one-way hash function chain in order to authenticate the message source. Cross-cluster multicast traffic includes message authentication codes (MACs) that are based on a set of keys. Each cluster uses a unique subset of keys to look for its distinct combination of valid MACs in the message in order to authenticate the source. The simulation and analytical results demonstrate the performance advantage of TAM in terms of bandwidth overhead and delivery delay. Index Terms—Multicast communications, message authentication, ad-hoc networks. Multiple factors make multicast authentication in ad-hoc networks very challenging. The issues are fundamentally due to the resource constraints and the wireless links. First, nodes have limited computing, bandwidth, and energy resources which make the overhead of basic asymmetric key-pair cryptography methods very expensive. In addition, the unstable wireless links due to radio interference cause frequent packet loss errors and require a security solution that can tolerate missed packets, as well as differentiate between packet retransmission and replay. Furthermore, the instability of the wireless links makes it unwise to rely on the continual involvement of a trusted authority in the generation and sharing of session keys since a stable connection cannot be guaranteed. On the other hand, while basic symmetric key cryptography methods are efficient, they are ineffective for multicast traffic patterns; since using a common key for all receivers will make it relatively easy to impersonate a sender by any of the receiving nodes. C. E. Perkins, Ad Hoc Networking. Addison-Wesley, 2001. H. Yang, et al., “Security in mobile ad-hoc wireless networks: challenges and solutions,” IEEE Wireless Commun. Mag., vol. 11, no. 1, pp. 1536–1284, Feb. 2004. Y. Challal, H. Bettahar, and A. Bouabdallah, “A taxonomy of multicast data origin authentication, issues and solutions,” IEEE Commun. Surveys & Tutorials, vol. 6, no. 3, pp. 34–57, 2004. A. Perrig, R. Canetti, D. Song, and D. Tygar, “Efficient authentication and signing of multicast streams over lossy channels,” in Proc. 2000 IEEE Symposium Security Privacy. R. Canetti et al., “Multicast security: a taxonomy and efficient constructions,”in Proc. 1999 IEEE INFOCOM. R. Safavi-Naini and H. Wang, “Multi-receiver authentication codes: models, bounds, constructions, and extensions,” Inf. Computation, vol.no. 1–2, pp. 148–172, May 1999. Perrig, et al., “Efficient and secure source authentication for multicast,”in Proc. 2001 Network Distributed System Security Symposium. A. Perrig, “The BiBa one-time signature and broadcast authentication protocol,” in Proc. 2001 ACM Conf. Computer Commun. sSecurity. A. M. Hegland, E. Winjum, S. F. Mjolsnes, C. Rong, O. Kure, and P. Spilling, “A survey of key management in ad hoc networks,” IEEE Commun. Surveys & Tutorials, vol. 8, no. 3, pp. 48–66, Dec. 2006. F. R. Yu, H. Tang, P. Mason, and F. Wang, “A hierarchical identity based key management scheme in tactical mobile ad hoc networks,”IEEE Trans. Netw. Service Management, vol. 7, no. 4, pp. 258–267,Dec. 2010. R. Gennaro, et al., “Strongly-resilient and non-interactive hierarchical key-agreement in MANETs,” in Proc. 2008 European Symp. Research Computer Security. 293–303, 2002.